Do you want to know how to your headline can steal the show? Let’s see some strategies that help your headline stand out among others. The word ‘you’ is vital, irrespective of the demographic or the audience. Need to understand what can make you healthy, wealthy, happy and successful. Using a number along with your headline will help to grab the attention of the reader. Try to use odd numbers, compare to even numbers, because odd numbers work better than even numbers. If you can, tap into the deepest fears or an emotional need to generate inquisitiveness. Then create an article that has real and helpful information, to create eagerness among the readers. You can use the question frequently asked by the customers or problem that the industry is facing. You can use the problem or question as your headline. Since, customers are looking for the answer or solution, it is likely that the readers will see the article. The headlines should not be either humorous or creative. The headline should be able to convey the message clearly, for this; the headline should be short and snappy. Use the expected words and phrases that are commonly used in the market. Need to use the right terminology and not get technical, making it difficult for the reader. The more you understand Digital Marketing; you will be able to craft more gripping headlines. The days, when your writer goes blank, your notebook with examples of headlines, can save the day. 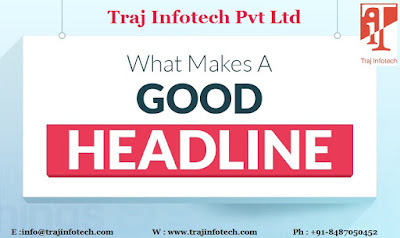 Make a list of headlines that are capable to of attracting the attention of the readers, gathering headlines should become a part of your work. The message should be clear and also specific. Whatever the topic, you should have specific information about the topic. Words that can connect to the emotions of a reader, the words used are, extreme, outstanding, astonishing, and powerful and many more. The headline should create a sense of urgency; this will force the readers to read, if they don’t, they will feel something is missing. You need to experiment with different types of headlines, before posting the perfect headline. Visit our website Traj Infotech - SEO Company in Ahmedabad to better services.